Ecwid’s API is a RESTful API with oAuth2 authentication. 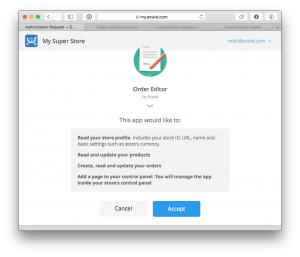 Any developer can use it to manage store data, add new interfaces to the Ecwid Control Panel, and even customize the storefront from an external application. The API specs and documentation provide examples and even a playground tool to explore the API’s capabilities, which is available here: http://developers.ecwid.com/api-documentation. Below, we highlight some of what feel are the coolest and most powerful features of the Ecwid API. The application authorization is based on oAuth2, allowing your application installation flow to be smooth and seamless for the end user. A merchant just needs to allow your application to access their data and they are done. The process works similar to the well-known Login with Google or Login with Facebook tools; no more copying and pasting API keys. Another great advantage of oAuth2 is the amount of control you can have over a store’s data; the ability to manage the specific data an application needs and access permissions on a granular level are inherent with the Ecwid API, giving you and merchants unprecedented control over customizing the online store. This also lets you be transparent about what merchant data you’re using and how you are using it, thereby increasing confidence in your application and building trust in the relationship with Ecwid merchants right from the start. 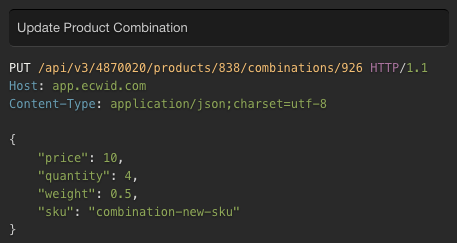 Using the Ecwid API, you can add your application right into the user Control Panel. Your application will work just like a native feature of Ecwid. Being integrated with Ecwid this way, your app will get more visibility and engagement with Ecwid merchants — it will be a part of a merchant’s Control Panel and smoothly integrate itself into the back-end management process. Using webhooks, you can receive instant notifications about changes in an Ecwid store. After you set them up for your app, you will be able to react instantly to the events you subscribed to. With Ecwid API Platform you can integrate any payment, shipping or discount provider. 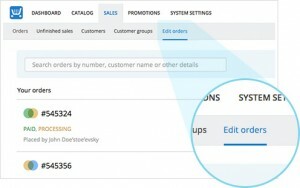 Alternatively, you can create your own custom rules and workflows, like free shipping for local customers based on current date, customer group other info from customer’s cart. The process is simple: Ecwid sends order information to your discount/shipping provider and expects it to return optional rates for the information provided. Custom payments work as any other payment — when customer selects that method at checkout, Ecwid will send all available order data there, to expect order status to be updated and customer returned back to the storefront. All these features are natively added to the Ecwid storefront, so it works seamlessly together with existing functionality. Running an online store nowadays requires many things to be tracked and stored. For example: Did the customer come from an ad campaign? Or were they referred by our affiliate partner?. To know and store things like this, use the Order Extra Fields feature. With Order Extra Fields you are able to save custom data to order and then later get it in order details via Ecwid REST API. It’s not just the private information too — you can add new optional or required fields right in the checkout process too. This information can be made visible in the order details to merchant and customer.